Losing one’s vision can be a devastating and frustrating moment in a person’s life. They begin to realize how many activities and small tasks require their vision. Conditions including glaucoma, macular degeneration, diabetic retinopathy, retinitis pigmentosa, among others can cause people to slowly lose their eyesight. When it begins to happen to you or a loved one, a whole host of emotions may rush over you. While not as commonly thought of, vision loss can have a real mental and emotional impact on the one suffering. Outside of the obvious physical handicaps that come along with vision loss, many sufferers feel frustrated, hopeless, and alone. Normal, trivial everyday tasks like cooking or getting dressed in the morning can become extremely difficult, leading many to feel a loss of independence. However, there are ways you or your loved one can cope and work through the struggles of vision loss. It is very important to make an appointment for an eye exam with an optometrist to truly understand the severity of your vision loss. Even if you feel as though your eye health is declining and there are only minimal issues, scheduling an eye exam will give you and your doctor a better understanding of how to treat your ailment. Like many who have suffered great loss, those whose vision begins to wane may start having feelings of depression and anxiety. This time in their life is increasingly difficult, and they may feel as if they are alone in this struggle. It is important to understand that if you or a loved one are suffering from vision loss that you are not alone. 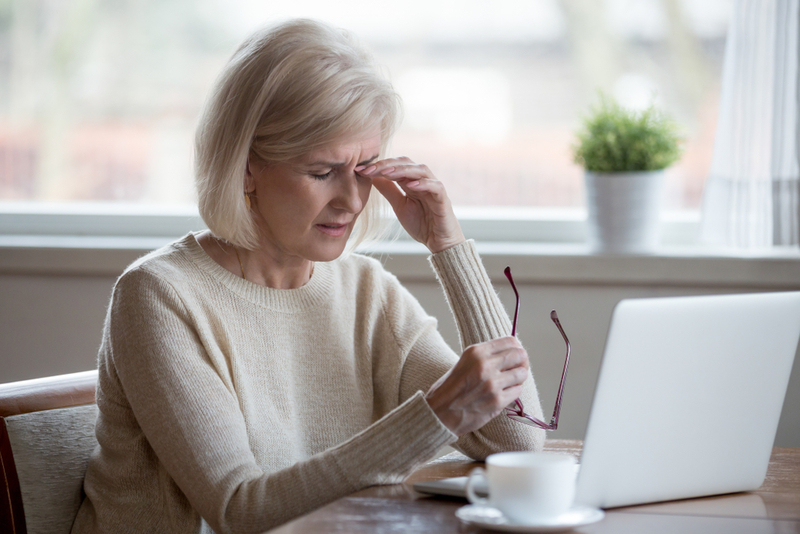 Vision loss affects more than 6.5 million people in the United States that are 55 years and older. If you are experiencing strong feelings of loneliness, always remember to reach out to others who are going through the same thing along with your doctor who can teach you proper eye care techniques. No matter what age you are, vision loss can always strike. However, it is most commonly found in mature adults. As mentioned, the loss of eyesight can bring with it serious feelings of loneliness, depression, anxiety, and loss of independence. There are numerous services available designed to help those who suffer these emotional troubles. From non-profits to counseling services, those with sight loss can seek the care they need to understand and navigate these complex emotions. Once you or your loved one are ready, you can begin to explore options that will make living with low vision much easier. There are classes and therapies in place to help those afflicted with severe vision loss adjust to everyday life. Simple tasks can become difficult, but through adjustment classes, you can learn new techniques and skills that will help you adapt to regain your independence. Improving mobility and motor skills in these courses can increase one’s patience and confidence in their life with low vision. The American Foundation for the Blind and Reader’s Digest Partners for Sight Foundation sponsor a website called VisionAware that offers a directory of services for every state that is designed to assist the visually impaired. There is a handful of helpful devices and technologies that can help those with low vision or blindness. If you are interested in learning more about these aids, visit your optometrist at First Eye Care DFW. Even though you may already implement many of these tips and tools, it is still crucial to schedule regular eye exams to better monitor your condition and eye health.